Roatan, the largest of the Bay Islands of Honduras, is noted for its pristine coral reefs, beautiful beaches, lush tropical foliage, and friendly people. Christopher Columbus discovered the islands in 1502 while on his fourth voyage and over the years it has been controlled by both the British and Spanish, as well as pirates and traders. The first permanent population of Roatan originated from the Cayman Islands, arriving in the 1830s shortly after the end of slavery in British colonies. Today, the population is about 30,000. The main town and capital of the municipality is Coxen Hole. Roatan is a long, narrow island measuring 37 miles in length, located about 30 miles from the northern Honduran mainland. The island has a mountainous backbone that provides for some excellent hiking opportunities, panoramas and lush scenery. Surrounded by warm Caribbean waters, this hilly island (frequented by diving enthusiasts) is picturesque, unspoiled and can take claim to being one of the region's fastest developing destinations. One of the most famous attractions in Roatan, the family owned iguana farm located near French Cay, is home to over 2,700 iguanas that roam freely about the property. Bring your camera! Experience the thrill of a dolphin encounter at this recreational and educational marine facility where you'll have the unique opportunity to interact with playful dolphins in their natural habitat. Descendants of the Black Carib Indians, the tribe settled in Roatan in 1797 and have maintained their lifestyle, culture and language to this day. Watch an ancestral dance performance with native costumes. Roatan's natural beauty is showcased throughout the 40-acre reserve that offers many different jungle trails and gentle pathways immersing you in the spectacular flora and fauna indigenous to the area. Located in West End, this expansive park offers the opportunity to enjoy playful monkeys, exotic birds, colorful gardens, pirate caves, and a relaxing beach…all in one day! Small in size but big in personality, the tropical atmosphere and charming streets of Roatan's seaside villages are alive with cafes, local vendors and colorful shops chock-full of unique gift items and souvenirs. Explore an underwater museum of sunken treasures, shipwrecks, and Mayan artifacts, or enjoy the rare thrill of scuba diving in the open sea alongside some friendly bottlenose dolphins! 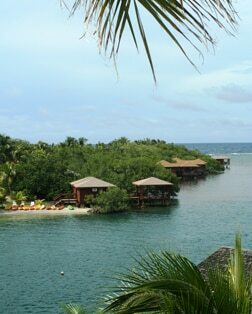 Paradise personified, Roatan has some excellent beach options. The aquamarine waters are wonderfully warm and teem with colorful fish. Snorkeling is accessible right from the beach in most locations.